A non-bank lender is a financial institution that offers home loans and other types of loans, but which doesn’t hold a banking licence. Some of the better known ones are Liberty Financial, Pepper Money, Virgin Money, Bluestone & La Trobe Financial to name a few. Australia has many non-bank lenders. Unlike banks, credit unions & building societies, non-banks cannot accept deposits therefore they are not ADIs (authorised deposit taking institutions). Because of the fact that they cannot accept deposits and then loan those funds out to customers, they need to source their funds from elsewhere. These funds are wholesale funds usually from Australian Banks or overseas institutions. They then sell this money to customers at a higher rate which is how they generate their profit. Another way non-bank lenders source money is through ‘securitisation’, which involves bundling together a group of mortgages and selling this as an asset to investors. Governance is another thing that separates non-bank lenders from mainstream lenders. ADIs are largely regulated by APRA (the Australian Prudential Regulatory Authority), while non-bank lenders are mostly regulated by ASIC (the Australian Securities & Investments Commission). Although we have seen recently APRA being involved with non-bank lenders also, albeit in a more advisory role rather than strictly a regulatory one. Why Consider a Non-Bank Lender? Non-banks have particular advantages over traditional banks in a few ways. 1. Their flexibility in niche scenarios: There are specialist non-banks who have made a space for themselves for example, by being providers of loans for those who are credit impaired. Years ago, lenders wouldn’t touch credit impaired customers due to their high risk nature and perceived increased chance of default. Today, there are products specifically created for this niche and these lenders have been able to grow and appeal to the wider market also with mainstream products. Niche products can come at a price though, whether it’s full price valuation fees, higher application fees & increased interest rates. 2. The way they assess repayments: Due to the different regulation of non-banks to traditional banks as mentioned earlier, some non-banks have different methods of assessing existing debt & new debt compared to banks. As an example, I have used a major bank and one of the better known non-banks to show the differences in how they assess debt. Liberty use 1.05% of actual repayments for existing debt. If your actual repayment on an existing loan is $2,500 per month, Liberty will assess this as $2,625. New loans with CBA are assessed at 7.25% (or the loan rate plus 2.25% – whichever is higher). If the rate was 4.69% on a $500,000 loan, the actual repayment would be $2,590 but CBA would assess this at 7.25% which would make the repayment $3,410. A significant increase compared to the actual repayment. There is a significant assessment difference between the two lenders as the above example shows in regards to existing debt from other financial institutions. This is where a lot of Liberty’s ‘generosity’ comes from. Granted, there is some difference in way new loans are assessed too, but the main point of difference is how existing debt is assessed. 1. Applicants (couple with 2 dependants) have a PPOR ($500,000 value & $200,000 loan with a rate of 4.00%), one investment property ($300,000 value & $240,000 loan with a rate of 4.50%) & are proposing to purchase a second IP at 80% LVR. For simplicity, all loans are 30 year terms, repayment terms are P&I and all existing loans are with other financial institutions. 2. Both PAYG applicants earn $60,000 gross per annum. 3. Two credit cards with total limits equalling $10,000. 4. Household living expenses are $3,400 per month. 5. Rental yields from the existing & proposed investment properties are 4.00% respectively. 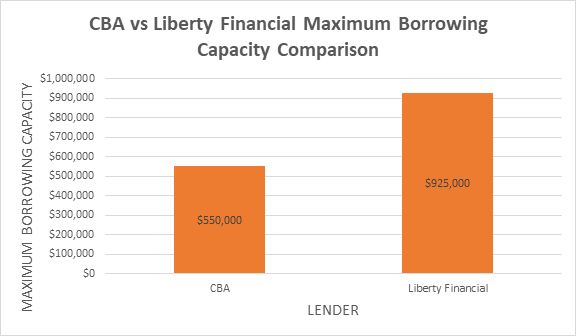 Graph: CBA vs Liberty Financial maximum borrowing capacity. As can be seen in the graph above, there is quite a significant difference between the two maximum borrowing capacities. Liberty is able to generously offer $375,000 more to the applicants than what CBA can & this is largely due to the way existing debt is assessed. So, Should I Use a Non-Bank? 1. Make sure you have a sound exit strategy. Due to the typically generous servicing calculators of non-bank lenders, it can be easy to be leveraged to the maximum. But just because it is possible, it doesn’t mean it should be done without further risk analysis & mitigation. Consideration must be given to an exit strategy such as selling off within a specified time or being able to refinance the loan elsewhere where income is expected to increase or overall debt is expected to be reduced to strengthen servicing position once again. Failure to have a sound exit strategy could leave you at the mercy of the non-bank. This means potentially much higher interest rates over time, fees & also the psychological strain caused by knowing you have been snookered into a corner with no foreseeable escape route. 2. Should not be used for long term buy & hold scenarios. Non-banks can predominately be used as a way to push your portfolio further where servicing is an issue with the bank lenders. Especially if an opportunity has arisen where there is a likely shorter-term gain. An example might be a red-hot market where you need to get in now or may lose capital gain opportunities. But as mentioned above, have an exit strategy or a plan in place to get out when the benefit of using the non-bank is no longer apparent. 3. Avoid higher than 80% LVR as it can become expensive. Non-banks are usually a little more expensive up until about 80% then become much more expensive after that. Fees can be quite significant for things such as valuations and also establishment & applicant fees not to mention LMI. Where possible try and keep the LVR to 80% maximum. alternatives for accessing equity plus new investment loans? Yes we are seeing this day in day out with many clients who have equity but unable to access it and move forward with their existing lender. All part of a brokers loan structuring armour. Certainly this could be an option for you. We are doing quite a few of these with investors such as yourself who have maxed out servicing capacity with the traditional lenders.